We have arrived at the 9th card of the series. The Rolling Thunder. I’ll let you enjoy this magnificent vehicle for a moment. 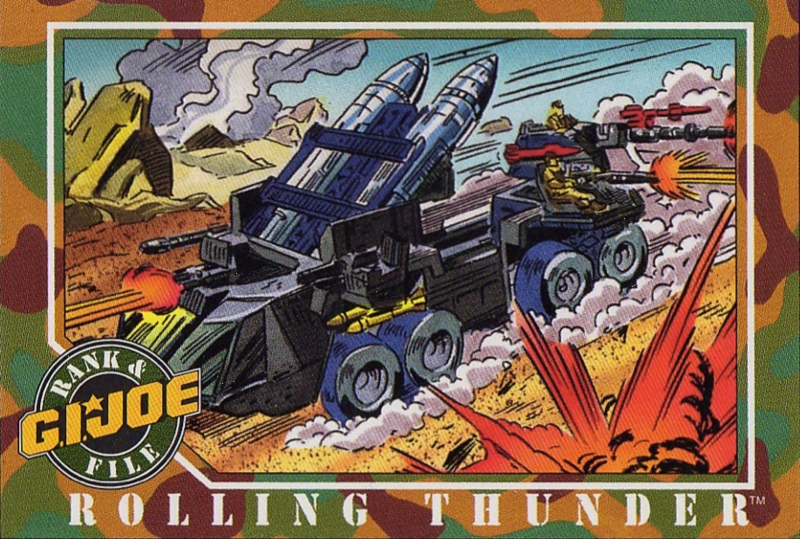 The Rolling Thunder was first released in 1988 and was sold with the driver Armadillo. Please read JoeADay’s blog for a full analysis of the figure. I didn’t have this vehicle as a kid, but it was the first Joe toy I bought on eBay as an official adult collector 🙂 To me, this is a huge playset. The only thing that came close was the General, but I didn’t have that too and I never even heard about the Flagg (I don’t think they released the Flagg in Belgium). I remember opening the box it came in (complete with driver, but just in a plain box) and feeling like a kid again. Then again, I still feel like a kid most of the time. 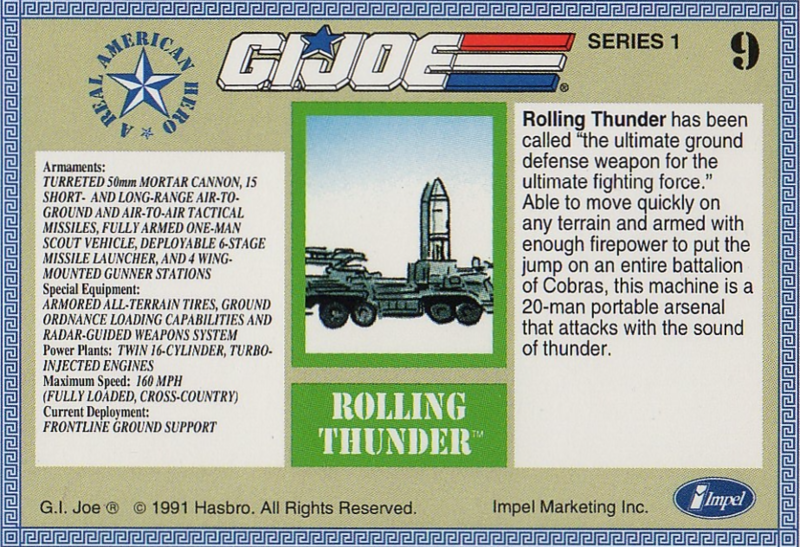 The Rolling Thunder (the name alone gives you shock and awe) can hold a lot of figures and it comes with missiles inside of rockets or is it rockets inside of missiles? In any case, if you’d see them comin’, you’d better be runnin’, right? It even had a big rotating cannon that needed to be controlled by 2 figures. And it had a missile on top of the gun barrel. Firing that would probably kill – or seriously injure – one or both of the figures operating it, but hey, in times of war, you need al the ammo you can get. The colors on the card art here, don’t do justice to the bright shades of the toy. Yellow rockets, red missiles, a missile launcher base, a small ATV, guns and cannons all around. This is one mean looking vehicle. 8 wheels of Cobra smashing trouble. With this ninth card, we arrive at the last card in the first Ultra Pro sleeve of my Trading Card collection. I’ve had several really good comments on the series and so I’ll be very happy to see you again when the next card is up for review. As always, leave a comment below or through Twitter. All that’s left for me now is, Happy Collecting and YoJoe!